Make no mistake – we are unwilling participants in a war – a war to “tame” the Internet. We’ve long been at war on the Internet in a sense and early on, there was no mistaking the enemy – cybercriminals. But, who would have considered that as the Internet evolved, the free thinking and freewheeling principles under which it was established, would come under attack? While it’s true that the battle against the cybercriminal element continues unabated, the level of conflict – and its direction – has vaulted into a new dimension. In a world driven mad by economic uncertainty, it’s hardly surprising that the principal players allied against Internet users, in the war to tame the Internet, are right-wing focused governments (who hold little regard for civil liberties and the right to freedom of expression) and, profit hungry corporations (who hold little regard for an individual’s right to privacy). China, based on it’s aggressive control of Internet dissent, has long borne the burden of being classified as the black sheep of the Internet family but, the reality is somewhat less clear. The U.S. government in its paranoid motivation to address self created issues in it’s war on terror (spurning the Constitution in the process), may well be in the forefront in the drive to change the focus of the Internet as we know it. “While Hillary Clinton likes to give speeches in which she fashions herself the world’s greatest defender of “Internet freedom,” the harsh reality is that her own government is its greatest enemy. Given the never-ending flow of draconian copyright and cyber security laws coming from Washington, this fact is getting harder and harder to conceal from the global public”. The U.S. is hardly alone in its contempt for the rights of the individual and it should be noted, that the long lineup of draconian governments has been enthusiastically joined by the governments of Canada, Australia, and the U.K. The stakes in the battle for control of cyberspace are enormous and, the outcome will affect you most directly. Taking the “path of least resistance” and allowing restrictive legislated Internet policies to wash over you, is just not on. Certainly not, if you wish to continue to use the Internet in the way in which it has evolved – free of unbridled government interference. Sir Francis Bacon (1561-1626) recognized that “Knowledge is power” and, if a situation ever existed in which the reality of this truth can be played out – this is one which qualifies. To effectively fight back against unconstrained government interference – you will require the knowledge to do so. With that in mind, I encourage you to spend some time reading an excellent series of articles published by the London based The Guardian newspaper. The series is wide ranging and includes coverage on issues from – governments attempts to control citizens, the rise of Facebook, Apple-style “walled gardens”’, the seemingly never ending attacks on privacy, the efforts to “tame” the web – and, much more. The Guardian is taking stock of the new battlegrounds for the internet. From states stifling dissent to the new cyberwar front line, we look at the challenges facing the dream of an open internet. Internet attacks on sovereign targets are no longer a fear for the future, but a daily threat. We ask: will the next big war be fought online? For many, the internet is now essentially Facebook. Others find much of their online experience is mediated by Apple or Amazon. Why are the walls going up around the web garden, and does it matter? Intellectual property, from copyrights to patents, have been an internet battlefield from the start. We look at what Sopa, Pipa and Acta really mean, and explain how this battle is not over. In the UK, the ancient law of defamation is increasingly looking obsolete in the Twitter era. Meanwhile, in France, President Sarkozy believes the state can tame the web. Meet the activists and entrepreneurs who are working to keep the internet open. Hundreds of websites know vast amounts about their users’ behaviour, personal lives and connections with each other. Find out who knows what about you, and what they use the information for. Is Windows boot time starting to get you down? Do you sometimes feel as if you could go and make a coffee while waiting for Windows to start? Let me tell you, if you feel that way, you’re not alone – it can happen to all of us. 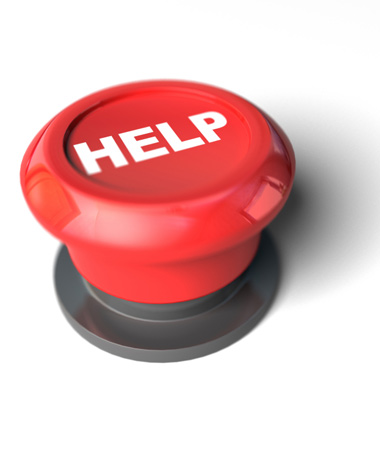 You’ll often find, after installing a new application, that it automatically triggers an auto-start command on system start up. That means, each time your computer is booted, this type of presumptive program is started with Windows, which is unlikely to be your intent, and in many cases is not needed. For example, iTunes is one of those programs that has this nasty habit. As a result of this program behavior, your start sequence can become considerably longer, system resources can be ravaged, and manually shutting down these unnecessary startups can be frustrating, and time consuming. The following is a perfect example of how out of control these presumptive auto-start applications can become. Recently, a friend asked me for advice on his sister’s computer that was slow at startup, and even worse, was slow in normal operation. It was easy to see why. The computer was loading 26 applications on startup, which then continued to run in the background, eating up system resources. 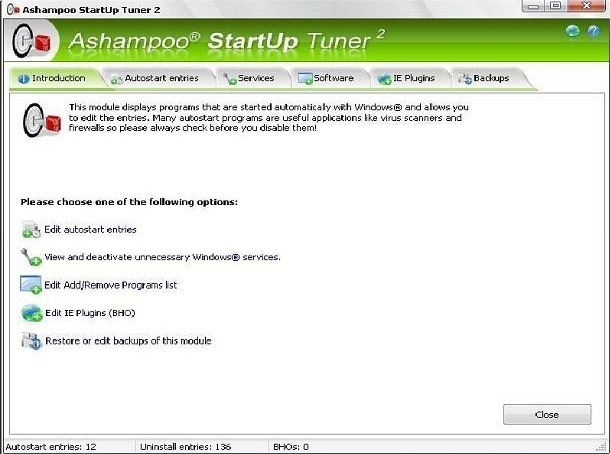 There are a number of manual methods available to deactivate these very irritating applications from auto starting, but a great free application from Ashampoo does the job quickly, cleanly, and with no fuss. 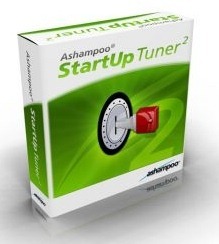 StartUp Tuner 2 lists all auto-start entries and allows you to individually delete or deactivate those entries. If you turn off all of the unnecessary entries (be sure they are not necessary), Windows will boot faster; in many cases considerably faster. StartUp Tuner 2 can do more than just this though. The tool can list all Windows services by name and it allows you to activate, or deactivate them, with the click of the mouse. The application shows all installed Windows programs, but it builds its lists more quickly than the control panel software module. You can then uninstall programs that are no longer required, including program entries that the native Windows uninstaller generally leaves untouched. Many Browser Helper Objects (BHOs) are useful, but others simply take up space on the Hard Drive and serve no useful purpose. StartUp Tuner 2 lists all of them, and allows you to delete, or deactivate them, if you determine you longer need them. The application automatically generates a backup of the changes that you have made, giving you the opportunity to reverse any changes. StartUp Tuner 2 can be used free for 10 days. After that time, free online registration is required. You will receive an activation code which will convert the test version of the program into the full version. Ashampoo loves to remind you of the value of their full software lineup, so if you find it bothersome to receive this type of email, you’d be better off passing on StartUp Tuner 2. Personally, I like to stay in the loop on new software developments, so I don’t object to receiving emails soliciting my business for new applications. One of the benefits of registering with Ashampoo is – they often give away full versions of their apps, just prior to the release of a new version. System requirements: Windows 2000, XP, Vista. Win 7 (no x64 support). Note: Full administrative rights are required to install the program. After it has been installed it can be used with any user account. Do We Need to “Fix” the Internet? Each time that you connect to the Internet you are unfortunately, wandering through a raucous neighborhood which has a reputation for being jam-packed with predators. These predators are intent on stealing your money and personal information, installing damaging programs on your computer, or misleading you with an online scam. Cyber-crooks are relentless in their pursuit of your money, and it’s all about the money. In the worst case scenario, your identity and your financial security can be severely compromised. Recently, Symantec reported that 51% of all the viruses, Trojans and other forms of malware it has ever seen were logged during 2009, and Symantec has been in the security business since before the Internet was launched. Each day, when I boot up my home machine, Immunet Protect, advises me that it is protecting me against 12 Million threats. Today for example (May 16, 2010, the number is 12,866,263. That number is truly mind blowing. Note: Later in the day, following a re-boot, I noticed that the protection level had risen to 12,876,095 – 10,000 additional threats had been identified. Various Internet security companies report having to deal with up to as many as 40,000 new versions of malware daily. Here’s the math; one new malware program every four seconds! Anti malware developer Comodo, looks at these numbers in a way that we can more easily relate to, in its instructive video – Did you Know? Dangers on the Web. “Did you know that the amount of new malware discovered daily approximates the number of words a person speaks daily? Seen in this way, cybercrime takes on a whole new dimension. Since additional sophisticated threats are constantly being developed, or are currently being deployed, some observers are of the opinion that the Internet is essentially broken. If you think this is an exaggeration, check this out and then you decide. Tainted search engine results: Internet security gurus have known for some time that we cannot rely on Internet search engine output to be untainted, and free of potential harmful exposure to malware. Cyber-crooks continue to be unrelenting in their chase to infect web search results, seeding malicious websites among the top results returned by these engines. When a potential victim visits one of these sites, the chances of downloading malicious code onto the computer by exploiting existing vulnerabilities, is extremely high. Infected legitimate websites: According to security solution provider Kaspersky, the rate of infected legitimate web sites, in 2006, was one in every 20,000. In 2009, one in every 150 legitimate was infected by malware, according to Kaspersky. Drive-by downloads: Drive-by downloads are not new; they’ve been lurking around for years it seems, but they’ve become much more common and craftier recently. If you’re unfamiliar with the term, drive-by download, they are essentially programs that automatically download and install on your computer without your knowledge. This action can occur while visiting an infected web site, opening an infected HTML email, or by clicking on a deceptive popup window. Often, more than one program is downloaded; for example, file sharing with tracking spyware is very common. It’s important to remember that this can take place without warning, or your approval. Rogue software: A rogue security application (scareware), is an application usually found on free download and adult websites, or it can be installed from rogue security software websites, using Trojans or, manipulating Internet browser security holes. After the installation of rogue security software the program launches fake or false malware detection warnings. Rogue security applications, and there seems to be an epidemic of them on the Internet currently, are developed to mislead uninformed computer users’ into downloading and paying for the “full” version of this bogus software, based on the false malware positives generated by the application. Even if the full program fee is paid, rogue software continues to run as a background process incessantly reporting those fake or false malware detection warnings. 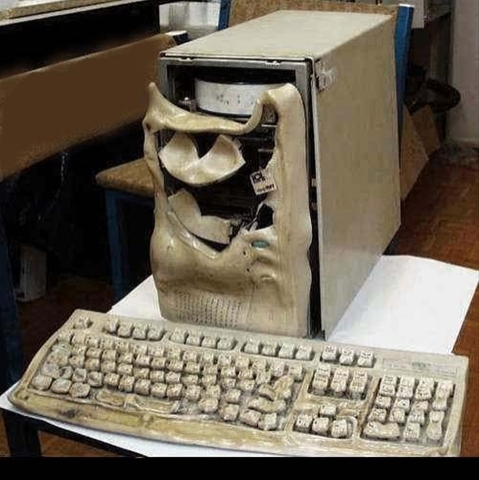 Over time, this type of software will essentially destroy the victim’s computer operating system, making the machine unusable. Email scams: Email scams work because the Cyber-crooks responsible use social engineering as the hook; in other words they exploit our curiosity. The fact is, we are all pretty curious creatures and let’s face it, who doesn’t like surprise emails? I think it’s safe to say, we all love to receive good news emails. It seems that more and more these days, I get phishing emails in my inboxes all designed to trick me into revealing financial information that can be used to steal my money. If you’re unfamiliar with phishing, it is defined as the act of tricking unsuspecting Internet users into revealing sensitive or private information. In a phishing attack, the attacker creates a set of circumstances where the potential victims are convinced that they are dealing with an authorized party. It relies for its success on the principle that asking a large number of people for this information, will always deceive at least some of those people. A personal example of how this works is as follows. According to a recent email (similar in form and content to 20+ I receive each month), my online banking privileges with Bank of America had been blocked due to security concerns. This looked like an official email and the enclosed link made it simple to get this problem solved with just a mouse click. What could be easier than that? Clicking on the link would have redirected me to a spoof page, comparable to the original site, and I would then have begun the process whereby the scammers would have stripped me of all the confidential information I was willing to provide. My financial and personal details, had I entered them, would then have been harvested by the cyber-crooks behind this fraudulent scheme who would then have used this information to commit identity and financial theft. These types of attacks against financial institutions, and consumers, are occurring with such frequency that the IC³ (Internet Crime Complaint Center), has called the situation “alarming”, so you need to be extremely vigilant. This is by no means an exhaustive list of the dangers we are exposed to on the Internet. There are many more technical reasons why the Internet is becoming progressively more dangerous which are outside the scope of this article. So what do you think? Is the Internet broken – do we need to fix it, and if so, how can we do that? If you’re the person who’s often asked by friends, to help them, their friends, their neighbors, ……..the list goes on, to reconstruct a computer that is not responding appropriately, has become loaded with malware, etc., then LogMeIn Express Beta is worth taking a look at. Running this free screen sharing/remote control application is simple – one of the easiest I’ve used. The sharer (host), downloads a small 874Kb applet from the LogMeIn Express site. You (viewer), enter a 12-digit code given to you by the sharer, e.g. email, and then enter the code on the LogMeIn Express website. That’s it – you now have access to their screen and remote control. To make it even easier, Chat is enabled – no voice support is included in this version. 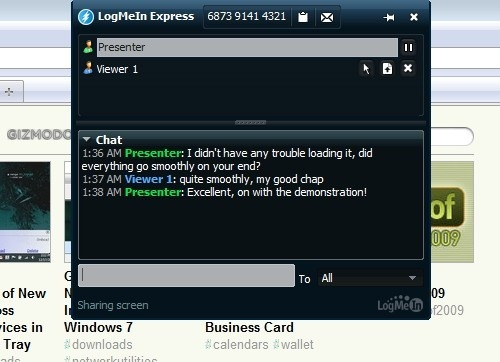 Security is built into all aspects of a LogMeIn Express session; the connection is secured using 256-bit SSL encryption. It struck me, that the typical computer user using LogMeIn Express , doesn’t need to know anything about ports or protocols, or any other complicated jargon, and with LogMeIn Express up and running, connection to the remote computer can be accomplished within minutes. A number of my friends, who are only moderately techno competent, have used this neat little tool to rescue their family’s and friend’s computers. Many have commented that it feels just as if they were working side by side with the remote user, on the same PC. I second that perception. Awesome! Bottom line: If you have the skills, and you have the opportunity to provide tech support to your family or friends, then LogMeIn Express might just be the tool you’ve been looking for. Keep in mind however, that this application is still in Beta. Personally, I like to stay in the loop on new software developments, so I don’t object to receiving emails soliciting my business for new applications. Is Windows boot time starting to get you down? Do you sometimes feel as if you could go and make a coffee while waiting for Windows to start? Let me tell you, if you feel that way, you’re not alone. If you enjoyed this article, why not subscribe to this Blog via RSS, or email? It’s easy; just click on this link and you’ll never miss another Tech Thoughts article. One of the things that I find really annoying when I install a new application is that program’s decision that it is so essential to system operation, that it automatically triggers an auto-start command on system start up. So that means, every time my computer is booted, this type of presumptive program is started with Windows, which is rarely my intent, and in most cases is not needed. As a result, the start sequence can become considerably longer, system resources can be ravaged, and manually shutting down these unnecessary startups can be frustrating, and time consuming. For example, recently a friend asked me for advice on his sister’s computer that was slow at startup, and even worse, was slow in normal operation. It was easy to see why. The computer was loading 26 applications on startup which then continued to run in the background, eating up system resources. 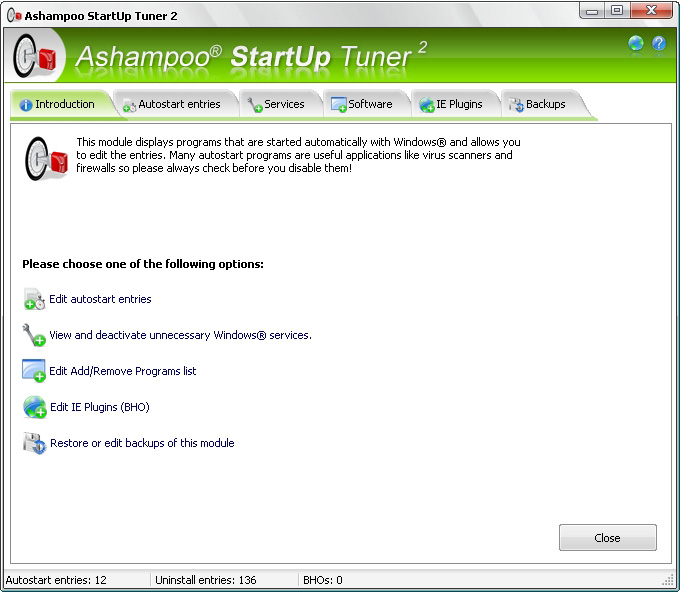 There are a number of manual methods available to deactivate these very irritating applications from auto starting, but a great free application from Ashampoo does the job quickly, cleanly and with no fuss. StartUp Tuner 2 lists all auto-start entries and allows you to individually delete or deactivate those entries. If you turn off all of the unnecessary entries (be sure they are not necessary), Windows will boot faster; in some cases considerably faster. The StartUp Tuner 2 can be used free for 10 days. After that, free online registration is required. You will receive an activation code which will convert the test version of the program into the full version. Personally, I find it easier to stay in the loop on new software developments, when I do receive emails soliciting my business for new applications.